The Park Avenue Armory was packed with photography enthusiasts today! We were so honored to welcome Nina Berman, Bill Eppridge, Lynn Goldsmith, Stephen Wilkes, among many other renowned photographers to our booth. Sunday, April 1 is the final day of the 2012 AIPAD Photography Show, 11 - 6. Please visit us in booth #419 and say hello! Today we were very honored to welcome in our booth Deena Schutzer, daughter of the late Paul Schutzer, Grey Villet's widow Barbara Villet (selections of Grey's photo essay of Richard and Mildred Loving are on exhibit); Ida Wyman, and Stephen Wilkes. The AIPAD Photography Show was featured in numerous reviews and articles today, including the New York Times, MSNBC Photo Blog, The DLK Collection ("A startling Nina Berman of a veiled woman with her diploma is on the outside wall" at Monroe Gallery). The Show continues tomorrow 11 - 7 (Bill Eppridge, Stephen Wilkes, and many other photographers will be in our booth), and Sunday 11 - 6. We look forward to welcoming you at Booth #419! "In the post-everything era, whose advent coincided with the rise of digitization in photography, it has often seemed, paradoxically, as if nothing new can be done. The negative consequence of this is that contemporary photographs can look a lot like vintage ones; the positive outcome is that new and intriguing connections are often made between past and present. Luckily, there are many examples of the latter at the AIPAD Photography Show New York." Please visit us in Booth #419, at the AIPAD Photography Show through Sunday. It’s not likely that Vivian Maier ever read pragmatist philosopher John Dewey’s classic 1934 text on art and aesthetics. It is certain that John Dewey never saw a photograph by Maier, whose work was virtually unknown until 2007. Yet the street photography of Vivian Maier could be a contemporary case study for Dewey’s grounding of art’s genesis in ordinary experience. Dewey’s notion of an experience—most often a common interaction—is key to art’s critical role in our lives: It constantly redirects our focus to the vital import of “ordinary” experience. Arguably, it is the most salient function of photography. Case in point: Vivian Maier, whose gelatin silver prints are featured at Monroe Gallery through April 22. Vivian Maier (1926-2009), born in the Bronx, worked as a nanny in Chicago in the 1950s and 1960s. Returning to New York City, she would pass her whole life as a caregiver, supported in the poverty of her old age by three of the children she had nannied in her early years. All she left behind was a storage locker stuffed with memorabilia. Unclaimed and delinquent in payment, the locker contents—placed in a Chicago auction house in 2007—were found to contain some 100,000 negatives, mostly in undeveloped rolls, taken by Maier over five decades. The negatives developed thus far reveal powerfully understated work by a major urban photographer of the last half of the twentieth century. A first, cursory look reveals the consistent depth of her work and the unerring eye with which she imbued formal and narrative import across a wide range of subjects. Maier’s sense of place is especially evident in her shots of New York City—for example, in scenes that evoke paintings by the Ash Can School: the street façade in September 28, 1959, 108th St. East, New York recalling Edward Hopper’s 1930 Early Sunday Morning, or the John Sloan rooftop view of the dining couple framed in the window of the second-floor Chop Suey restaurant (Untitled, 1953). The latter photo’s choice of an unusual vantage to underscore human exchange occurs again in New York, NY, April 1953, another restaurant shot, taken from a railing directly above a young woman and a man in army uniform holding hands across a table—a private moment whose intimacy is breached innocently by the camera’s lens and ominously by the date of the print, taken some three months before the end of the Korean War. Maier’s shots of human encounters are more than matched by her views of urban locales, where an epic sense of place vies with their sheer artistry as formal studies. An aerial view of a steel pylon dwarfing two pedestrians nearby (Untitled, no date); a worm’s eye view of a huge warehouse whose towering wall is stenciled with an “X” formed by the crossed shadows of two adjacent steel girders from an elevated train line (Unknown, September 1956); in Undated, Chicago, the dramatic recession to a distant vanishing point, beyond its pinhole portal at the far side, of a skyscraper’s colossal portico whose soaring Promethean columns are mocked by their incorporeal shadows strewn across its retreating marble corridor; in Untitled, 1955, a promenade high above the East River overlooking a massive Romanesque building enveloped in mist hosts a family of sightseers menaced by the looming bulk of a sharply foreshortened lifeboat suspended overhead, pointing far beyond and below them to a fog-laden inlet between the docks—a brilliant, blade-runner composition in black and white. Finally, there are the crowd shots like 1954 New York in which Maier’s extraordinary eye for the ordinary mediates a benign balance between the monumental and the intimate, achieved in each instance by her attention to that rare, fleeting composition where the human subject exerts a dual role as formal agent and narrative device. Thank you to all our friends who joined us at tonight's opening of the 2012 AIPAD Photography Show. We were honored to have renowned photographers Bill Eppridge, John Loengard, Stephen Wilkes, Ida Wyman, and many others in attendance. For its 32nd edition, the annual trade fair organized by the Association of International Photography Art Dealers (AIPAD) follows the evolution of photography and its market. From March 29 through April 2 in New York, the market bubble of the past few years will inevitably remain. Whether it be rare 19th century prints, photography’s most glorious pictures, icons of pop culture from the middle of the past century or the contemporary work from the 1980’s that provoked the boom, its popularity too. But don’t be mistaken: acquiring an image signed by Cartier-Bresson, Walker Evans or Diane Arbus, even their most renowned, will always cost much less than a picture by Cindy Sherman or Andreas Gursky. Sometimes even 5 times less. Regrouping some of the most prestigious galleries, AIPAD exposes nearly all of the world’s artists. Beyond the masters, from Steichen to Weston, including Talbot or Levitt, one can find more contemporary talents including Linda Mc Cartney, Alex Prager, Jeff Wall or Nan Goldin. Impossible to ignore another evolution, that of the portrait, a photographic medium omnipresent in contemporary Western visual culture, from magazines to art galleries. Celebrities, rock stars, movie stars: all have a special place on the white walls of the AIPAD. For the wealthy buyer, a picture by Philip-Lorca diCorcia could cost more than $45 000 at the David Zwirner gallery, while other visitors could head to Steven Kasher’s gallery to purchase an image of the Wall Street protestors signed by Accra Shepp for $60. Whether one comes to invest or just to admire, AIPAD remains a beautiful showcase for photography. 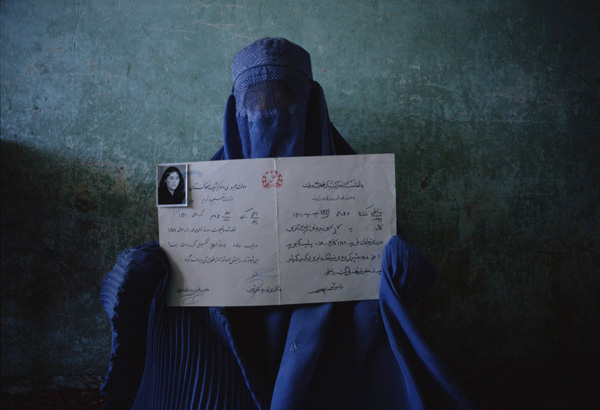 We delighted to return to exhibit at the AIPAD Photography Show in New York March 28 - April 1, 2012. The show is again at the Park Avenue Armory, and Monroe Gallery of Photography will be located in booth 419. In our expanded booth, Monroe Gallery of Photography will be exhibiting specially selected work from the gallery's collection. Highlights include: new photographs from Stephen Wilkes' acclaimed "Day To Night" series; significant contemporary photographs by Nina Berman; important and historic photojournalism including photographs of the Civil Rights movement and Grey Villet's photographs of Richard and Mildred Loving taken during the landmark Supreme Court case overturning all race-based restrictions on marriage in the United States; and much more. Show tickets are available for purchase at the Park Avenue Armory during Show hours. Steve McQueen would be 82 today. "Racing is life....everything before and after is just waiting." See John Dominis' photographs of Steve McQueen at the AIPAD Photography Show, Monroe gallery of Photography, booth #419. The art world acknowledges this unique significance and reflects it in the monetary value placed on the works. So is a $4.3 million too much to pay for the world’s most expensive photograph? Considering that it less than two percent of what was paid for the most expensive painting, I’d say it’s a bargain. Although this image of a Greek police officer punching a news photographer at an Athens street protest was shot last fall, it didn’t come to our attention until yesterday. But the passage of several months makes it no less dramatic or shocking. And it remains timely for what it represents: the tensions between police and media all over the world, including the US, where Occupy protests show signs of stirring once again. 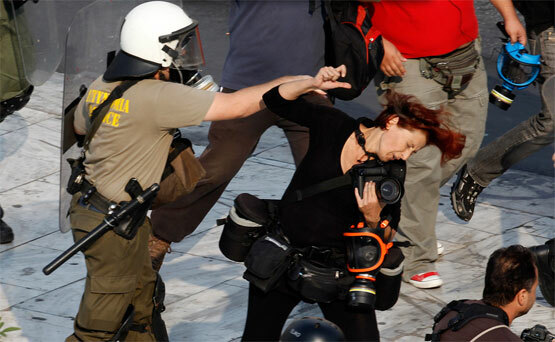 In this image, shot by Reuters photographer Yannis Behrakis, a police officer punches veteran photojournalist Tatiana Bolari, co-owner of the Greek photo agency Eurokinisi. The incident occurred at an anti-austerity protest on October 5 when police moved against a group of photographers and journalists covering the event, Behrakis told PDN. Related: Freedon of the Press? Whether you’re seeking that perfect print by Diane Arbus (you know the one, the identical twin girls in pinafores) or something new from a contemporary photographer, such as a multimedia wall relief made of LED lights by Jim Campbell, you’ll likely find what you’re looking for at the annual photography fair organized by the Association of International Photography Art Dealers, better known as AIPAD. Now in its 32nd year, AIPAD will be held at the Park Avenue Armory from March 29 through April 1, with offerings ranging from rare 19th-century material to the latest works by today’s digital artists. “AIPAD is definitely worth two or three visits, not one drive-through,” says William Hunt, a top collector in the field. Vivian Cherry: "Ocu-Lav", Hell's Kitchen, c. 1950's. Vivian Cherry was born in New York City. While performing as a dancer on Broadway and nightclubs in the early 1940s, she began working as a photographic printer in the darkroom for Underwood & Underwood, a prominent photo service to news organizations. It was here that Cherry became a talented printer. Wanting to further her interest in photography Cherry joined the Photo League, an organization formed by professional photographers in the 1930s to teach and support the art of photography. She studied with Sid Grossman. Soon Cherry was selling her photographic essays to such publications as Life, Look, Popular Photography, Sports Illustrated and Redbook. Then later, she was given assignments by Colliers, Pageant, This Week, Jubilee, Scope, and other magazines. Cherry was one of a handful of women at the time to be given assignments by such major publications. Cherry also made several short films and worked with the photographer Arnold Eagle as a still photographer on a film about Lee Strasberg and the historic drama school, the Actor’s Studio. Over the years Cherry has traveled and photographed extensively in New York City, West Virginia, Georgia, England and Mexico. Although her photographs cover a wide range of cities, the images are universal. Through her lens she captures everyday life of the children, men and women on the streets of the world. One is hard pressed to distinguish between the old stodgy men on the sidewalks of London and the ones sitting on a bench in Washington Square park. Or to see any differences in the somber and sullied faces of the children in Hell’s Kitchen and the ones in the alleyways of England. Likewise, the sense of weariness and forlorn gazes are not lost on the viewer when comparing the two images of the elderly woman from the Blue Ridge Mountains in Georgia and the older women riding the Third Avenue El in New York City. It seems that no matter what street corner she is on, Vivian Cherry has the innate ability to look through her camera and produce a portrait that reflects a sense of life that is both timeless and ageless. In 2000 The Brooklyn Museum of Art presented a major exhibition of Vivian Cherry’s photographs. Vivian Cherry is still actively photographing, and the book “HELLUVA TOWN: Vivian Cherry's New York of the 1940s-1950s”will be published in 2007. Top curators, collectors, artists, critics, and gallerists will take part in AIPAD Panel Discussions during the run of The AIPAD Photography Show New York on Saturday, March 31. Please note the new location at Hunter College (one block from the Park Avenue Armory on the corner of East 68th Street and Lexington Avenue). Tickets are $10 per person, per session, and will be available for purchase at the Park Avenue Armory during Show hours (Thursday through Saturday, as available). Tickets are limited and sold on a first-come, first-served basis. See detailed information below. A Conversation with Rineke Dijkstra Contemporary women photographers are being feted in a number of solo exhibitions at top museums across the country this year. This interview with the internationally recognized Dutch artist Rineke Dijkstra will offer a rare opportunity to hear about her inspirations and thoughts before her upcoming retrospective at the Solomon R. Guggenheim Museum in June 2012. The interview will be conducted by Jennifer Blessing, curator of photography, Solomon R. Guggenheim Museum, New York. Curator’s Choice: Emerging Artists in PhotographyTwo major exhibitions in New York City during the run of The AIPAD Photography Show New York are of note—the Whitney Biennial 2012 at the Whitney Museum and Perspectives 2012 at the International Center for Photography. This panel will feature top curators discussing trends in photography and video. Panelists will include: Sarah Meister, curator, Department of Photography, The Museum of Modern Art, New York; Christopher Phillips, curator, International Center for Photography, New York; and Joshua Chuang, assistant curator, photography, Yale University Art Gallery, New Haven. How to Collect Photographs: What Collectors Need to Know NowWhat important artists are being talked about right now? What do collectors need to know? What art fairs should be on your calendar? How has the photography market changed in recent years? Seasoned collectors will offer tips for both first-time and experienced buyers. Speakers will include: Kenneth Montague, director, Wedge Curatorial Projects, Toronto; and Joseph Baio, collector, New York. The moderator will be Steven Kasher, Steven Kasher Gallery, New York. A Celebration of Francesca WoodmanTo commemorate the traveling retrospective of Francesca Woodman (organized by the San Francisco Museum of Modern Art), experts will talk about the importance of this groundbreaking artist and her enduring legacy. Panelists will include: Julia Bryan-Wilson, associate professor, art history, University of California, Berkeley; Sloan Keck, designer, and friend of Francesca Woodman; and Elisabeth Subrin, artist and assistant professor, department of film and video, Temple University, Philadelphia. Italian Contemporary PhotographyDuring the run of The AIPAD Photography Show New York, an important exhibition will be on view at Hunter Art Gallery, New York. Peripheral Visions: Italian Photography, 1950s – Present will showcase the work of major Italian photographers who have explored unconventional images of Italy. The moderator will be Sandra Phillips, senior curator of photography at the San Francisco Museum of Modern Art. Speakers will include: Maria Antonella Pelizzari, exhibition curator and professor, history of photography, Hunter College and the Graduate Center, CUNY; Yancey Richardson, Yancey Richardson Gallery, New York; Julie Saul, Julie Saul Gallery; and Olivo Barbieri, artist. Ticket InformationTickets are $10 per person, per session, and will be available for purchase at the Park Avenue Armory (643 Park Avenue at East 67th Street) during Show hours (Thursday, March 29 through Saturday, March 31, as available). Tickets are limited and sold on a first-come, first-served basis. Tickets will not be sold on-site at Hunter College. We encourage you to purchase tickets at the Park Avenue Armory before Saturday, March 31. This year, due to the high level of interest, AIPAD Panel Discussions will be held in the Hunter West Building at Hunter College. The entrance to the Hunter West Building is located on the corner of East 68th Street and Lexington Avenue, just one block from the Park Avenue Armory. Enter through the West Lobby and proceed to the sixth floor, room HW 615. Photo ID may be required. The 6 train stops directly under Hunter College at the 68th Street station. There is an entrance to the Hunter West Building in the subway station. Turn right upon exiting the turnstile and the entrance will be directly in front of you. For detailed directions, visit the Hunter College website. For more information about The AIPAD Photography Show New York or the AIPAD Panel Discussions, call +1.202.367.1158 or email info@aipad.com. BRIAN HAMILL: "has contributed to some of the most memorable images taken during the 60’s and 70’s"
The image above of De Niro and Pesci first caught my eye from Brian’s catalog of work, but as you start to dig, the faces that shaped our world in the 1960’s and 70’s begin to emerge from behind his lens. Visit Monroe Gallery of Photography (Booth #419) during the AIPAD Photography Show March 28 - April 1 to view some of Brian Hamill's photographs. 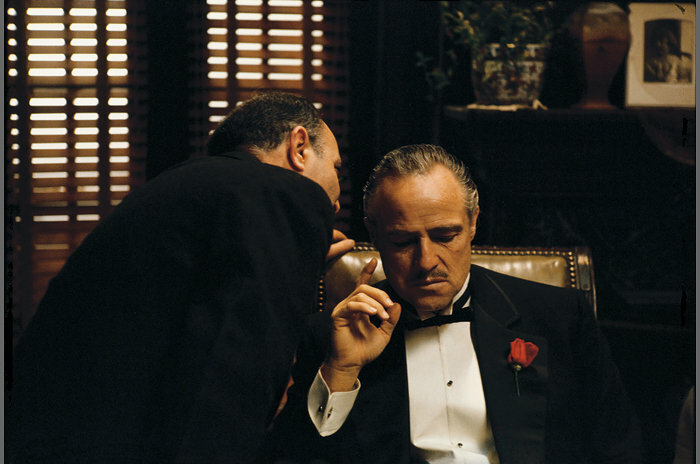 Steve Schapiro: The Whisper I, Marlon Brando in "The Godfather"
The American photographer Steve Schapiro was present during the political and cultural changes in the US in the 1960s. As a young photojournalist, Schapiro received commissions for Life magazine, which, among other things, included following Martin Luther King until the day he was murdered. Schapiro played Monopoly with the then unknown boxer Muhammad Ali and hung out with Andy Warhol and the Velvet Underground in The Factory in Manhattan. At the time, Schapiro had no inkling that his photographs depicted people who were to become some of the icons of the Sixties. In his unique images, Schapiro captured the character and charisma of his subjects. He calls his series of photographs of the icons of the Sixties Heroes, a photojournalistic term denoting the picture chosen by a picture editor for a cover of a magazine. In the exhibition, the Sixties icons are presented side by side, depicting a time of change in the United States. Steve Schapiro’s perhaps best known pictorial series include his unique stills from the classic movies The Godfather (1972) and Taxi Driver (1976). In the 1970s, Schapiro was hired to take exclusive photographs during the filming of Francis Ford Coppola’s and Martin Scorsese’s archetypal movies. As a still photographer, Schapiro depicted the shoots from unique angles and his photographs portray the drama, the scenes and the actors, all at the same time. The photographs capture and freeze classic film scenes, such as the whisper into Marlon Brando’s ear, the kiss with Al Pacino, Robert De Niro, gun in hand, talking to his reflection in the mirror, and a young Jodie Foster walking the streets of New York. The photographs balance between fiction and reality and are today regarded as legendary in film history. Steve Schapiro (b. 1934 in Brooklyn) began taking photographs at the age of ten. Trained by the renowned photojournalist W Eugene Smith, Schapiro received commissions for magazines such as Life, Time, Rolling Stone, People and Newsweek. Schapiro has worked on over 200 feature films, including TheGodfather, Taxi Driver and Midnight Cowboy, and has exhibited widely internationally and now lives in Chicago. We are terribly sadddend by the passing of our friend Stan Stearns. It’s so iconic the rights to publish and use it have been resold twice for millions of dollars.“Stan wound up with $25." “One exposure on a roll of 36 exposures,” Stan Stearns marveled decades later. The young news photographer, in one instinctive click, captured one of the most poignant and reproduced images of the past half-century: little John F. Kennedy Jr., grief-stricken, saluting his father’s coffin as it rolled by on a caisson. Mr. Stearns died of cancer March 2 at the Mandrin care facility in Harwood, said his niece, Karla Bowles. He was 76 and had spent the past four decades running a photography studio in his native Annapolis. His most enduring contribution to photography indisputably came on the chilly morning of Nov. 25, 1963, when he covered the funeral procession of the President John F. Kennedy. Mr. Stearns was working in Washington for the United Press International wire service when Kennedy was killed in Dallas. Outside Washington’s Cathedral of St. Matthew the Apostle, where the president was celebrated and mourned a few days later, Mr. Stearns was jammed with 70 other photojournalists into a roped-off space meant for perhaps half as many. As Kennedy’s caisson rolled by, Mr. Stearns trained his telephoto lens on first lady Jacqueline Kennedy, who was veiled in black. When she bent down to whisper in her son’s ear, Mr. Stearns clicked as 3-year-old John Jr.’s right hand snapped into a salute. The boy was dressed in a blue dress coat and short pants. It was also his birthday. He returned to the office, satisfied that he had the best picture of the day. The picture made the front pages of newspapers worldwide and was printed in mass-circulation magazines such as Life. The image came to define the emotion of the event in a way words may not have had the power to convey. Just the mention of the salute can still revive memories for those who lived through that day. It remains one of perhaps a handful of pictures that evoke the span of the mid-20th century: Joe Rosenthal’s image of the flag-raising on Iwo Jima during World War II, Eddie Adams’s photo of a South Vietnamese general’s street-side execution of a suspected Viet Cong, Nick Ut’s picture of a naked Vietnamese girl fleeing a napalm attack. Mr. Stearns’s picture still resonates so completely because it speaks to the “trope of the brave little soldier that existed in American visual culture,” said Alison Nordstrom, a senior photography curator at the George Eastman House, a photography museum in Rochester, N.Y.
Nordstrom said the Kennedys so fascinated the public because they were a young, photogenic family and so vibrant in the wake of the Eisenhower years. Familiar images of the Kennedy children — John Jr. hiding under his father’s desk, the president’s daughter Caroline with a pony — crystallized the way the public knew and identified with the family. In 1999, John Kennedy Jr. was presumed dead after a small airplane he was piloting went missing. He was 38. Mr. Stearns’s picture was again summoned to remind readers and viewers of what the former first son had once represented. Stanley Frank Stearns was born May 11, 1935, in Annapolis, where his parents owned a jewelry shop. His interest was jazz drumming until a relative gave him a Brownie Flash Six-20 camera for his bar mitzvah. He attended Annapolis High School and, at 16, began working as a photographer for the Capital newspaper. His marriage to Maxine Skwersky ended in divorce. Survivors include a son, commercial photographer Jay Stearns of Annapolis; a brother; and four grandchildren. News and government photographers periodically made claims to the famed image of the salute. All were discredited, but the compensation was entirely in glory, Mr. Stearns wryly noted. UPI - Stan Stearns, 76, who took the photo of little John Kennedy Jr. saluting his father’s coffin, died March 2. What if a World Press Photo of The Year was taken in America? John Maloof: "I had absolutely no interest in photography as an art form before I found Maier's work. She sparked my obsession in photography." We start everyday reading la lettre de la Photographie. Today we discovered a comprehensive interviw with John Maloof, "the man behind Vivian Maier". "In 2007, while seeking material for an unrelated project, John Maloof happened upon the photographic oeuvre of Vivian Maier at auction. Said Chicago auction house had acquired 10,000 rolls of her film, 20-30,000 of which were undeveloped, amongst other belongings from Maier’s neglected storage locker. Maloof’s intriguing photographic purchase would morph, unwittingly, into the kind of pivotal discovery that’s the stuff of Ali Baba’s cave: an unearthing of bounty completely undiscovered by the rest of the world. Having no prior photography background, John Maloof was nonetheless captivated by the images he bought, to the point that it inspired him to test out street photography for himself. He stated on his blog that, when he walked the same Chicago streets that Vivian Maier had, and tried to capture what she had been able to, he “realize[d] how difficult it was to make images of her caliber.” With this realization, Maloof put Vivian Maier’s work online in order to contextualize the images within a more knowledgeable photography community. Though his impetus for making her work public was an amateur’s curiosity, the fervent reactions to Maier’s black and white photographs brought forth a tide of spellbound fans riveted by these images. Maier’s street scenes depict those authentic moments when people unsuspectingly let their guard down, and even her frontal portraits have a feeling of reveal. The subjects range from playful children to dozing elders, hardscrabble drifters to primly elegant ladies, listless young men to toiling workers: all collective participants in the rhythm of the American metropolitan landscape. " Full interview and slide show here.